There is nothing more frustrating than sitting down, being in the right headspace to work, and coming to the sudden realization that you’re missing a key piece of knowledge needed to get started. Having to track down that item, shoulder-tap an expert, or realize that you don’t even know where to look for it impedes productivity. When knowledge is scattered, not only does the work suffer, but you suffer. Compounding this problem is the fact that most platforms and teams are disconnected, as traditional SaaS applications are often implemented to solve one specific problem for one particular group. Consequently, not only is knowledge siloed and scattered, but so, too, is the expertise behind it. At Guru, this is the problem we work tirelessly to solve. Our mission is to bring you all of the knowledge to do your job — when and where you need it most. Since day one, we’ve been working to make this a reality by unifying knowledge from across your company, verifying its accuracy, and making it available everywhere people do their work. 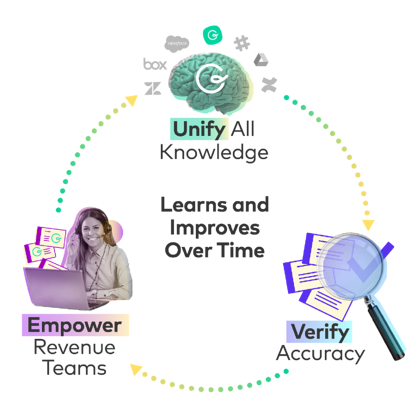 When we launched our AI Suggest Text and Knowledge Sync features, syncing knowledge from external tools and using AI to contextually suggest knowledge in places like chat tools, CRMs, ticketing solutions and email, we knew this was only just the beginning. At Guru, AI isn’t one feature or layer; it’s core to every single thing we do. We believe AI can be leveraged to make humans better at their jobs, not automate them out of one. For us, text was just one of the many channels in which we needed to support our customers — a necessary first step in a larger vision to empower revenue teams around the world. That’s why, in November 2018, we extended this functionality with AI Suggest Voice, empowering revenue teams with knowledge while they’re on the phone with customers, making conversations fluid and valuable. 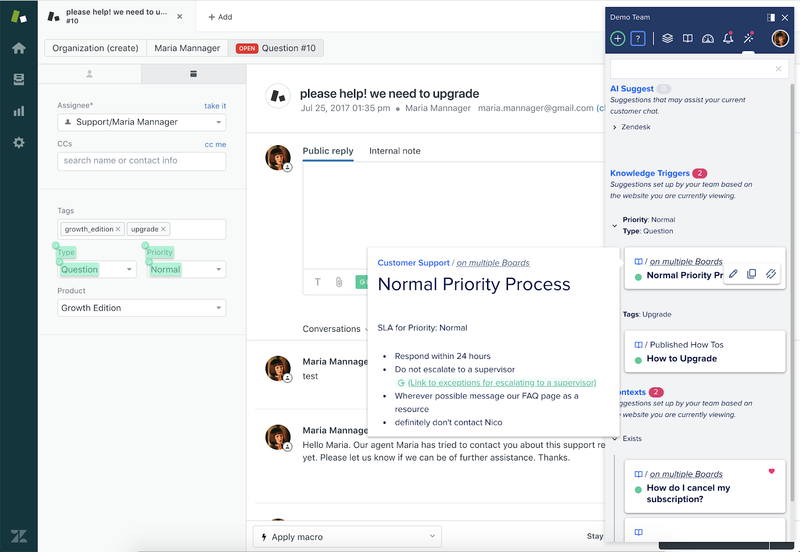 Today, we’re excited to announce four new features to further cement our promise of unifying your enterprise-wide knowledge, verifying its accuracy, and empowering your revenue team. With features like AI Suggest Text, suggesting knowledge in-context is powerful. At the same time, we recognize that knowledge is only as good as the expertise behind it. 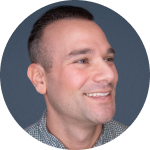 Often times, the wrong people will be responsible for the wrong information — compromising the accuracy of knowledge and limiting your revenue team’s ability to answer questions with confidence. With AI Suggest Expert, Guru automatically identifies the exact subject matter expert to field a question or to verify knowledge accuracy. While AI Suggest Text suggests knowledge dynamically and automatically, it’s also important to give our customers control over the knowledge being surfaced to their teams. Recognizing that complicated issues and processes require custom and situational coaching, we’ve built Knowledge Triggers. With Knowledge Triggers, it’s easier than ever to structure knowledge to surface in context. Knowledge Triggers allow teams to map certain Cards (pieces of knowledge) to specific fields on any webpage so that their team can be coached with the right knowledge to do their job. When a user is on a page with a suggestion, they'll see a badge on the corner of the Guru extension. Clicking to open Guru will surface all of the suggested Cards, and tell the user why they are appearing. They can then use this information to better assist their customers and prospects, or improve workflow efficiency. In addition, Knowledge Triggers has "and"/"or" rule-making so teams can set up coaching for more complex processes. Knowledge Triggers can be used to get your lower-performing sales and support reps to follow the same steps as the top-performing reps; increase win rate; increase percentage of sales reps exceeding quota, and support handle times. It can also act as a safety net for new hires, reducing both onboarding time and time wasted looking for information (including shoulder-tapping subject matter experts for information). In effort to continue to unify your team’s collective knowledge, we’re pleased to introduce Google Drive to our ever-growing list of syncs. With Google Drive Sync turned on, all of your Google Drive folders can be imported into Guru, making them readily available across all of your applications through the Guru browser extension and Slack integration. 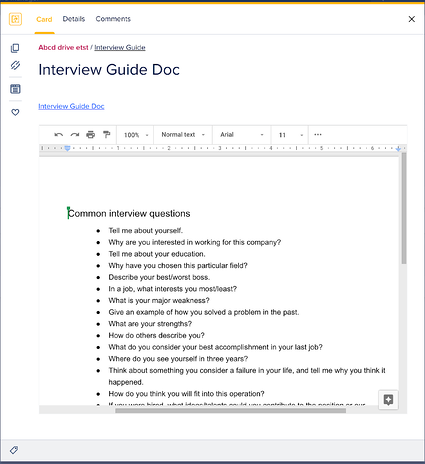 With Sync, your team has all of the Google Drive knowledge they need at their fingertips, empowering them to move faster, answer customer questions more accurately, and drive more revenue for your business. For teams with lots of external assets, Google Drive Sync allows your team to sync assets (i.e. one pagers, PDFs, longer documents such as case studies) from your Google Drive into Guru, and incorporate those assets into your knowledge base. Sync for Google Drive allows your revenue teams to access these assets in Guru, while maintaining your marketing team’s current Google Drive workflow. All synced assets are linked to and iframed within a Card, so your revenue teams can see what they're sending before sharing it with a customer. Teams can share these synced assets with Content Performance to track how they influence opportunities. As part of our vision to empower your teams with knowledge everywhere they work, building a best-in-class knowledge experience in Slack has been a focus for us ever since Slack announced its ecosystem. If you’re working in Slack, you should stay working in Slack. Managing, adding, or accessing knowledge should not require you to leave your workflow, particularly in a collaboration hub like Slack where so much knowledge is being shared regularly. With Slack Time Preferences, we’ve increased the amount of flexibility you have in working with knowledge in Slack. Control the time and frequency of notifications like never before. The Guru bot Slack task queue lets you manage knowledge and verify its accuracy directly in Slack, and now you can schedule the bot to ping you at a time most convenient to you. 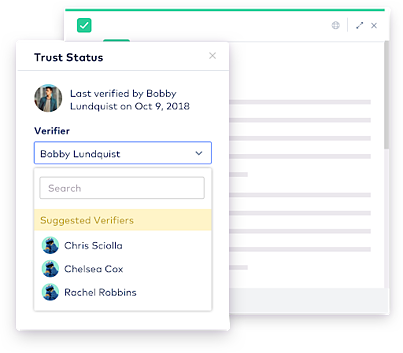 Customizing notifications to individual schedules and workflows increases the likelihood that verifiers will complete the task upon being pinged, thus increasing trust in an organization’s knowledge. As we eye the rest of 2019, we believe more than ever in AI’s ability to make us better at our jobs, and have committed to finding ways to put your knowledge to work for your Revenue Teams. We know these feature additions are important to you, and to helping you move towards frictionless knowledge sharing. We’ll be launching another batch of new product updates to help further cement this vision later this spring, so rest assured that our work on your behalf never stops. We can’t wait for you to see what’s coming next.